Summer is here! The weather has warmed up, the pool is filled and we are looking forward to some summer fun. I feel like so many of my great childhood memories are from summer vacation. We hope our kids have a summer filled with lots of great memories. We aren’t going on any fancy trips or exotic destinations, although we wouldn’t mind it 😉 We are make amazing, great memories right here at home this summer. Roasting marshmallows after an evening swim. We are also enjoying summer with a few of our favorite summer diffusing combinations. I wanted to share them with y’all so you too could enjoy the smell of summer without all the harmful chemicals you get from wax warmers and candles. We have a great solution to all that yuck! Hope you enjoy them. Let me know if you have any special combos that you enjoy in the comments below or check out this video were I tell you all about them. With the weather warming up, everyone is heading outside in the sun more. So I just wanted to remind y’all, to NOT use any Citrus Essential Oils on your skin if you will be out under the sun during the next 24 hours. Citrus Essential oils will magnify the effects of the sun and can cause you to burn. 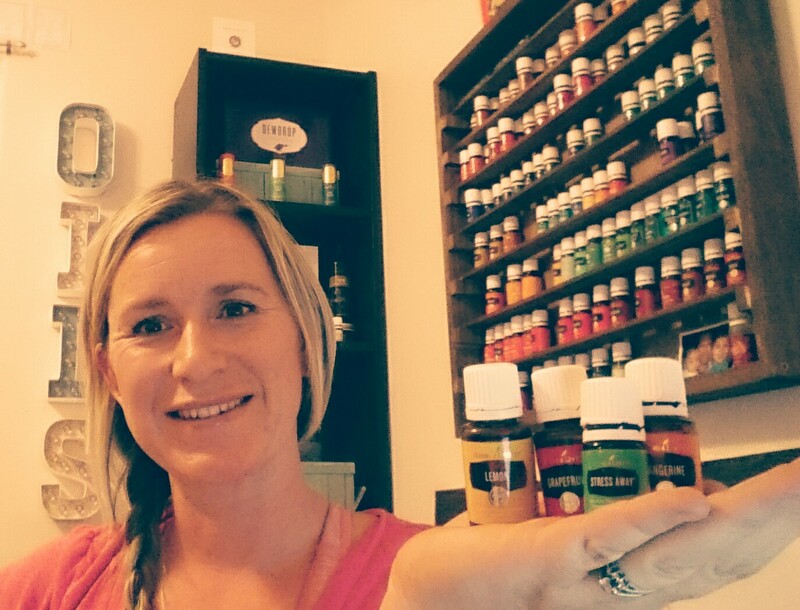 Don’t forget about citrus oils in blends like Stress Away! Wow!!!! These promos are amazing!!! So many fun products that I haven’t tried before. Be sure you don’t miss out on them. OK, So you know I have been on a mission to remove as many chemicals from our home as possible. Well, this has lead me to my makeup and I have found some great options. Check out this blog post about 100% Pure Makeup and see what I think of it. But mascara ………. this has been a very hard thing to find. First off, there are very few natural mascaras offered out there. Second, if you are lucky enough to find one, it is usually a pretty BIG hit to your pocket book. So I kept looking and trying out all different kinds without breaking the bank to do it. Then last week while shopping I saw Pacifica Aquarian Gaze Mineral Mascara at Target. Yes, you saw that right TARGET!!! I honestly can’t remember the price but it was no more then $15. I kept thinking, there’s no way this is going to work???? Well, drum roll please…… IT DID WORK and AMAZINGLY! I am so impressed with this mascara and how well it stayed put ( NO RACCOON EYES!!!) I usually have a problem with conventional mascara smudging by afternoon and most natural mascara only lasted an hour or two before smudging. Let’s be real here, I put my mascaras to the ultimate test out here in the country sweating like crazy while feeding, watering, bathing, ridding, collecting eggs, gardening, you name it… in all kinds of weather. Rain, snow, crazy winds 100+ heat. It has to be pretty tough to make it through my days. So when I say this mascara stayed put, that’s a big thing. Plus, my eyelashes felt soft. Not all hard and clumpy the way they usually do with regular mascara. This mascara made it look like I had long, thick eyelashes but felt like I was wearing nothing. I am truly ecstatic about this find and so happy to share it with you. I will continue my search for quality natural makeup but for now I am pleased to say, my transition to all natural makeup is almost complete I will share the last thing I am looking for next week when it arrives. Hopefully it too will be a big hit! This month is Young Living is offering some amazing promos for Canada members. This is for the OTG site. Are you excited about these promos?? I sure think they are Amazing. Who doesn’t love or need some Ningxia Red!!! Looking for some ideas for Mothers Day? 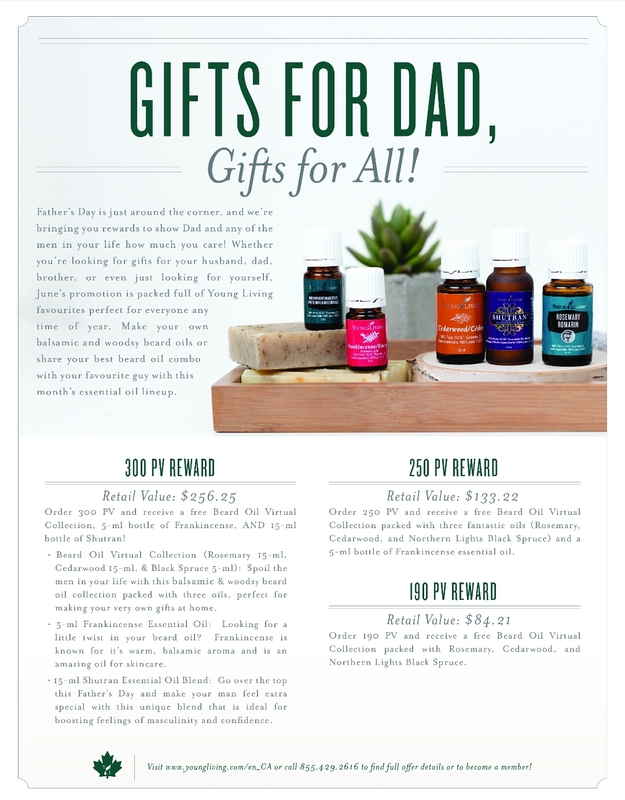 Well Young Living has you covered with their May promos. Not only can you get something for your mother, but even a little something for yourself. 425 PV Reward Offer Details • Offer is valid only in the U.S. and all NFR markets, except where restrictions prevent promotional product(s) from entering the country. • Offer is valid from 12 midnight, MT, May 1, 2016, to 11:59 p.m., MT, May 31, 2016. • Limit of one free ART Skin Care System, one Dewdrop Diffuser, 20 Essential Rewards points, 15-ml Melrose, and 5-ml Manuka essential oil per qualifying standard order. • Limit of one free ART Skin Care System, one Dewdrop Diffuser, 20 Essential Rewards points, 15-ml Melrose, 5-ml Manuka, and 5-ml Cedarwood essential oil per qualifying Essential Rewards order. • Your 20 Essential Rewards points will be available to use on or around June 20. • In the event that supplies of these items become unavailable, Young Living may replace promotional products with equivalent products of a similar value. • Limit of one qualifying standard order and one qualifying Essential Rewards order per month. • PV minimum must be reached in a single order. Partial orders placed throughout the qualifying month cannot be combined in order to receive the offer. • Single orders over 425 PV do not earn duplicate rewards. • PV is not earned on free product. • Offer does not apply to Essential Rewards point redemption orders. • Offer is earned via phone, Essential Rewards, and online orders only. • Offer is available to Young Living members and retail customers. • Member is responsible for shipping costs associated with ordered and free product. 325 PV Reward Offer Details • Offer is valid only in the U.S. and all NFR markets, except where restrictions prevent promotional product(s) from entering the country. • Offer is valid from 12 midnight, MT, May 1, 2016, to 11:59 p.m., MT, May 31, 2016. • Limit of one free Dewdrop Diffuser, 20 Essential Rewards points, 15-ml Melrose, and 5-ml Manuka essential oil per qualifying standard order. • Limit of one free Dewdrop Diffuser, 20 Essential Rewards points, 15-ml Melrose, 5-ml Manuka, and 5-ml Cedarwood essential oil per qualifying Essential Rewards order. • Your 20 Essential Rewards points will be available to use on or around June 20. • In the event that supplies of these items become unavailable, Young Living may replace promotional products with equivalent products of a similar value. • Limit of one qualifying standard order and one qualifying Essential Rewards order per month. • PV minimum must be reached in a single order. Partial orders placed throughout the qualifying month cannot be combined in order to receive the offer. • Single orders over 325 PV do not earn duplicate rewards. • PV is not earned on free product. • Offer does not apply to Essential Rewards point redemption orders. • Offer is earned via phone, Essential Rewards, and online orders only. • Offer is available to Young Living members and retail customers. • Member is responsible for shipping costs associated with ordered and free product. 250 PV Reward Offer Details • Offer is valid only in the U.S. and all NFR markets, except where restrictions prevent promotional product(s) from entering the country. • Offer is valid from 12 midnight, MT, May 1, 2016, to 11:59 p.m., MT, May 31, 2016. • Limit of 20 Essential Rewards points, 15-ml Melrose, and 5-ml Manuka essential oil per qualifying standard order. • Limit of 20 Essential Rewards points, 15-ml Melrose, 5-ml Manuka, and 5-ml Cedarwood essential oil per qualifying Essential Rewards order. • Your 20 Essential Rewards points will be available to use on or around June 20. • In the event that supplies of these items become unavailable, Young Living may replace promotional products with equivalent products of a similar value. • Limit of one qualifying standard order and one qualifying Essential Rewards order per month. • PV minimum must be reached in a single order. Partial orders placed throughout the qualifying month cannot be combined in order to receive the offer. • Single orders over 250 PV do not earn duplicate rewards. • PV is not earned on free product. • Offer does not apply to Essential Rewards point redemption orders. • Offer is earned via phone, Essential Rewards, and online orders only. • Offer is available to Young Living members and retail customers. • Member is responsible for shipping costs associated with ordered and free product. 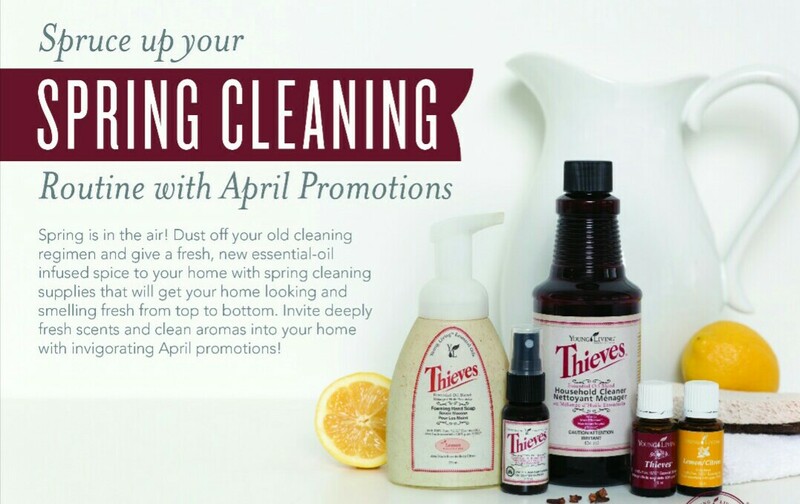 Spruce up your spring cleaning routine with fresh April promotions featuring our popular Thieves products! Place your qualifying April order, and receive our Thieves Essential Oil blend, Thieves Foaming Hand Soap, Thieves Spray, Thieves Household Cleaner, Lemon essential oil, and up to $20 in product credit. Orders totaling 190 PV, 250 PV, or 300 PV will qualify for free product, and give you the extra spring cleaning inspiration you need. Order 300 PV or more and receive a free 15-ml bottle of Thieves Essential Oil blend, Thieves Foaming Hand Soap, Thieves Spray, Thieves Household Cleaner, a 15-ml bottle of Lemon essential oil, and a $20 product credit! Order 250 PV and receive a free 15-ml bottle of Thieves Essential Oil blend, Thieves Foaming Hand Soap, Thieves Spray, and a 15-ml bottle of Lemon essential oil. Order 190 PV and receive a free 15-ml bottle of Thieves Essential Oil blend, and Thieves Foaming Hand Soap. Product credit will be issued by the end of the month following the promotional period and can be spent like cash to purchase the Young Living products you love.